Photo Ranch: Peregrinos en la esplanada de Basilica de Guadalupe, Mexico D.F. 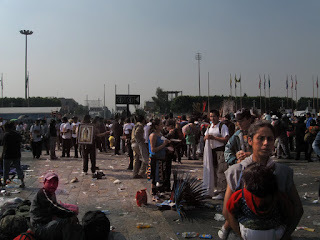 Peregrinos en la esplanada de Basilica de Guadalupe, Mexico D.F. Vast numbers of pilgrims come to the basilica to celebrate the appearance of the Virgen on December 12. Literally on foot and on bicycle from locations far from Mexico City. Many of them bring blankets and sleeping materials to camp out on the plaza during their stay.